White House Farm was previously known as Esole Farm until the early 1900’s. The present farmhouse appears to be a mid to late 15th century hall type house which was later extended, probably in the late 16th century, to give it its present appearance and size. The farm was part of the Manor of Essesole and can be identified in the manorial roll of 1501, unfortunately there is as yet no definite identification of the farm from other older documentary sources. The 1501 roll records the farm as follows: “The heirs of John Castell hold half an acre in their messuage (house and outbuildings) between the Common Way twds the E & N (the present Easole Street and Beauchamps Lane respectively) and land of Wm Boys twds the W and land of Simon Quylter twds the S (now two bungalows and Four Limes) rendering thence yearly 2d (to the Lord of the manor, at this time the Abbot of St. Alban’s)”. The late John Castell had also owned some 15 acres of land on the manor for which he had to pay five shillings and a half-penny annually in manorial rent as well owing suite of court (attending the manorial court) every three weeks. His heirs would have had to pay one years rent to the Abbot on inheriting the house and land. The farm was sold to the Boys’ of Fredville at sometime in the early 1500’s and it became part of the large East Kent land-holdings. At some time in the early to mid 1500’s the original timber framed house was extended and became a residence of younger sons of the family. The timber frame was also enclosed in brick most probably in the latter part of the 16th century. Holt Street farmhouse was re-built in brick around 1600 to 1605 and was the residence of Edward Boys, son and heir to Edward Boys of Fredville. The brick work on both houses is very similar, especially the corbelling, so Esole farmhouse may have been brick clad at around the same time as Holt Street farm house was re-built. The aisled barn that runs along Beauchamps Lane is tarred weatherboard over a timber frame laid upon brick [possibly originally flint] foundation walls and probably originally dates from the early 1600’s. 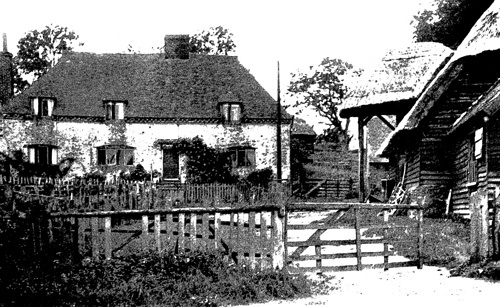 The farmhouse with the early 17th century barn, an early 20th century view. Major John Boys of Fredville was is in constant financial difficulties during the 1650’s and 1660’s and, according to William Boys’ 1802 biography and pedigree of the Boys family, “by his own extravagance he much encumbered and wasted the estate of Fredville”. The Major used various parts of his estates as security for loans and mortgages. In 1658 he mortgaged various holdings, including Esole Farm, for £1,550.00 to Thomas Turner, his brother-in-law. This mortgage was renewed in 1668, but the debt was never re-paid and Esole Farm came into the possession of the Turner family and in 1698 William Turner, Esq., of Gray’s Inn, London, leased the farm to William Payne, a yeoman of Nonington, for seven years for an annual rent of £40.00, rising to £50.00. “Easole ffarme” then consisted of a “messuage or ffarmhouse at Easesole in Nonnington with barns &c. lands arable meadow & pasture containing by estimation 100 acres now in occupation of John Austen. Also one piece of arable land containing by estimation 30 acres in Nonnington between Easesole alias Yessallhole there and a certain ffarm called Kettington alias Kethampton now also in occupation of said John Austen”. The lease was renewed again in 1705 and in 1707 the lease was amended to include “8 pieces of land contg. about 16 acres lying in a ffield called Yesole ffield (Easole Field, the large open fields on either side of Mill Lane) in Nonington purchased by Wm Turner of Wm. Hammond Esq (part of East Stoole farm)-rent increased £8”. William Payne, also Paine, continued to lease the farm from the Turner family until October of 1717 when it was let to Judith Payne, his widow, for a further seven years. In 1753 Esole Farm was included in the marriage settlement when Bridget Turner, of White Friars in Canterbury, married David Papillon, sole son and heir to David Papillon, Esq., of Acrise in Kent. The farm remained with the Papillon family until sometime in the early 1800’s when it came into the possession of the Hammonds of St. Alban’s Court. The 1861 census records it as St. Alban’s Farm, it was then two dwellings with Thomas Fagg, farm bailiff, living in one part and Henry Castle, carter, in the other. By 1871 the house was a single dwelling where Frederick Atwood, farm bailiff, lived with Thomasin Gilham, an elderly widow, as his house-keeper and in 1901 George Garlinge, a brother of my great-grandmother, Lydia Rogers, was the working farm bailiff living there. Easesole Farm was part of the St. Alban’s estate until the estate was sold off in 1938, when, along with Home Farm, and Church Farm, it was bought by a member of the Vestey family. The Vestey fortune had been founded on South American beef in the early 1900’s. The three farms had been leased from the 1920’s by Mr. Harry Crawford, whose Scottish father, David, had been the St Alban’s estate land steward [first referred to in the 1881 census as living at the present Home Farm]. 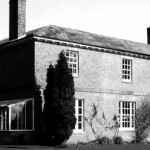 The farms were then sold again in the early 1950’s, Esole Farm was bought by Mr. Wilf Barwick; Home Farm was bought by his brother, Ted; and Church Farm by brother, Vic. Wilf Barwick farmed White House Farm until 1973 when he retired from farming and sold the farm but continued to live in the house for some years until he sold it and moved to a bungalow nearby.